Welcome to the new genealogy page for WikiKin. The previous site software was limited to 30,000 individuals, which limit I have recently exceeded. So I am now using TNG (The Next Generation of Genealogy Sitebuilding, v.11.1) software. You will notice many additional features that were not previously available here, such as charts, photos, and maps. 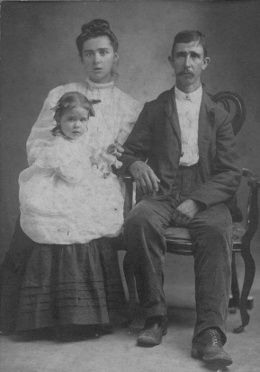 My maternal great-grandparents, William Thomas Humphrey and Hortense "Tensie" White, along with my great-aunt, Lilla Estelle Humphrey.